MONROE, Ga. -- They take their greens seriously at Bear Creek Golf Club. The consistent, smooth and speedy putting surfaces are among the things golfers like most about this friendly semi-private club located between Atlanta and Athens. A natural rock outcropping that resembles a bear sits behind the 18th hole at Bear Creek Golf Club. The greens were converted to Champion Bermuda in 2011 and the project was overseen by Morris Brown, who helped create the strain of grass and owns Champion Turf Farms. The yarn-spinning Texan was quite involved with the process and left the folks at Bear Creek with some excellent green complexes. The greens are one of the defenses on the course, which plays just 6,585 yards from the black tees and 5,951 from the white tees. The greens have plenty of undulation, a number are tiered and others are diabolically sloped toward the trouble that surrounds them. The club tries to hold them to around an 11 on the Stimpmeter, but when conditions heat up in the summer they can exceed 13. "When they get that fast you can get in trouble on a 3-footer if you hit it on the wrong side of the hole," said Ron Palmer, general manager at Bear Creek. That sort of local knowledge is very helpful at Bear Creek, not only on the greens but also all around the course. It's a club that needs to be played once to get the proper bearings. But once you have a concept of where to hit it -- or where to avoid hitting it -- you have a chance to do well. The main thing to remember at Bear Creek is to keep the ball in play. The fairways aren't necessarily tight, but most of them are bordered on at least one side by trees. It's very easy to lose a few golf balls on the course, especially if you've got a bad case of the slices. "I like it," said John White of Snellville, who joined the club about a year ago. "There are some tricky holes, but the greens are always very good and the people are very nice." Bear Creek's front nine starts with a long par 5 (601 yards from the black tees, 530 from the white) that doglegs to the left. After hitting a drive, the hole turns and drops dramatically toward the green. It's a very good starting hole. The most difficult hole on the front is no. 4, a par 4 that's loaded with trouble. Bordered by a pond on the right, you really need to hit it 200 yards to have a chance. The landing area past the dam is about 50 yards long and anything longer will leave you with a downhill lie for a testy approach shot over a marshy area that bisects the fairway. An errant drive will almost certainly lead to a bogey or worse. No. 7 is probably the signature hole. The par 3 plays 209 yards from the black and 174 from the white. In addition to the length, there's a pond that runs down the right side of the hole past the green. Anything that's fading when it approaches the green is likely to wind up in the brine. Last year divers recovered about 30,000 balls from the pond at no. 7. Bear Creek's back nine starts with a shortish par 5 (468 black, 440 white), which plays downhill to a green protected by a bunker on the left front. But this fairway is narrower than most and there is out of bounds lurking on the right. The 11th hole is a medium-length par 3 (166 black, 154 white) that plays over wetlands and a pond, which also wraps around the rear of the green. Anything hit to the right will likely be wet. It's quite scenic from the tee. The most difficult hole on the course is the par-4 13th, which plays 413 yards from the black. It requires a 200-yard carry off the tee to carry a pond. The hole plays only 310 yards from the white tees, but the tee ball must be properly positioned to have a chance. A creek bisects the fairway about 100 yards from the two-tiered green, and there's a tree plopped on the left side of that hazard that protects from that angle of attack. This hole can bite you in many different ways. The 18th is a par 5 that plays 480 yards from the black tees from a tee box that was dropped 77 yards farther back. It plays a manageable 397 from the white tees. Position is important here, as the fairway slopes to the right and will take anything off line down toward the trees and possible doom. The fairway flattens out about 150 yards from the green, and hitting that area makes an approach shot less difficult. But there's some water and a hazard that juts into the fairway at the 100-yard mark, which adds some drama as you approach the elevated green. Behind the 18th hole you'll also see a natural rock outcropping that resembles a bear. It isn't the reason the club picked the name, but it's a nice reminder at the end of the day. Bear Creek opened in 1990 as Woodlake Golf Club, which was owned by the Eagle Greens group. But when the economy went sour, Eagle Greens sold off its golf properties to individual parties. 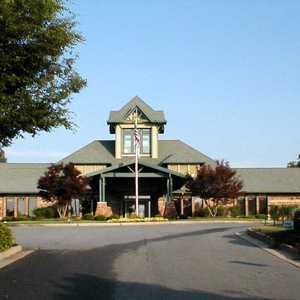 The current ownership group bought the facility in August 2008 and immediately began to make improvements, culminating with the greens conversion in 2011. Phillip Ballard, who also designed Apple Mountain in Clarkesville and The Chimneys golf course in nearby Winder, designed Bear Creek. He took advantage of the land that was available, some of it that wanders through wetlands and pine forests. There is some undulation change, but it isn't overwhelming. Six acres of the property were set aside as a wildlife refuge area. It's a good place to see deer, turkey, raccoons and about a million squirrels, which try to hide from the hawks that live there. You never know what sort of critter you'll see. The course remains a semiprivate facility. Members have more flexibility on tee times and receive other perks. About 21,000 rounds will be played at Bear Creek in 2015. For some reason the original owners and developers of the property decided against buying enough land to have a driving range. The club is still paying for this short-sighted decision. They have hitting nets that can suffice for a pre-round warm-up session, however. 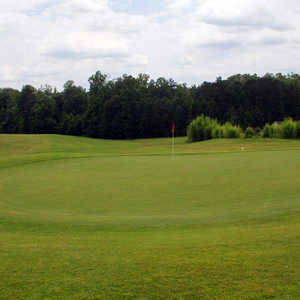 The practice green is ample in size and mirrors the conditions you'll find on the golf course. There isn't a PGA Professional on staff, but Bear Creek has an arrangement with a professional from a nearby club if anyone requests information about lessons. The clubhouse isn't fancy, but it has plenty of room. The pro shop has a good supply of golf balls and equipment, as well as a television and some chairs for the regulars. There's a food area and a meeting room, which can host banquets. There's even an ATM and an old-fashioned Coke machine on the premises. Bear Creek Golf Club is a nice and relatively inexpensive place to play. It won't ever host the PGA Championship, but that's okay. It fits nicely in a niche for an affordable place with generally good conditions. The greens alone put it on sound footing. The people are extremely friendly and welcoming to visitors. Once you've played the course and learned your way around, you'll want to come back again. I consider this a no frills, well maintained, reasonably challenging golf course. Management is congenial and things in general are low key. 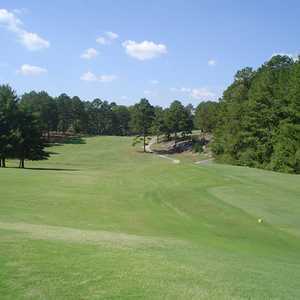 Bear Creek is a good place to play a fun round of golf while appreciating it's natural surroundings. Allow yourself more than one round here to grasp the course nuances. Then, hit'em straight and don't be short.